Most volunteers fly into Bole International airport in Addis Ababa either late at night or early in the morning. We recommend having a warm jacket with you when you arrive, as Addis Ababa is over 2400m above sea level and night time temperatures are surprisingly cool. After a short walk off the plane through to the arrival lounge, you will be greeted by a Projects Abroad staff member. If you arrive late at night, you will travel by taxi to your host family where you can take a shower and rest for the remainder of the night. 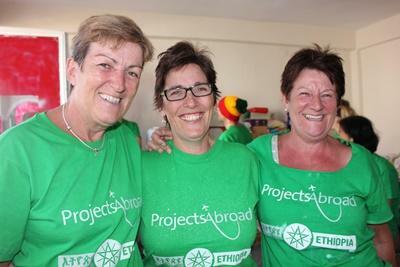 You will then spend the following morning with a Projects Abroad staff member, learning how things work in Addis Ababa, before heading out for a traditional Ethiopian meal for your first taste of the ubiquitous Injera. If you arrive early in the morning, you will be taken to a hotel where you will be left to rest for a few hours until a Projects Abroad staff member returns to take you to our local office. You will be able to meet the rest of the local staff before your induction, where you will be shown around Addis Ababa. During your induction, you will be taken on a tour of the city and our staff will show you several important places, including where you can change currency, the post office, notable landmarks, and internet cafes. The staff are eager for volunteers to see as much as possible, so they may even find the time to take you to visit a museum or teach you about Ethiopian society. At the end of the day, you'll be taken to your host family. Our host families are mostly middle class Ethiopians living in their own single-story family homes throughout the city. Initial introductions will probably take place over a traditional coffee ceremony, so you'll learn about this aspect of the culture, and get the chance to savor the taste and aroma of arguably the best coffee in the world. You will find that Ethiopians eat a lot of meat; mainly beef and chicken in a variety of different spicy stews called wot. There are always a huge variety of dishes available at each meal, including vegetables, lentil stews, wots, and salads - all of course heaped generously atop your injera. The following day you will be taken to your placement. Most volunteers live near enough to the placement to walk to work, however some volunteers will have to take public transport. Either way a member of staff will show you the way, pointing out local landmarks. If you are participating on a Standard Project, all necessary work-related transportation costs will be covered by Projects Abroad. Blue-and-white painted minibuses - public taxis - are the quickest and most popular form of public transport, and they go everywhere in Addis Ababa. They also stop anywhere - all you have to do is put your hand out to halt one, and remember to say "waraj!" - "stop!" - loudly when you see your destination. There are also plenty of blue-and-white painted Lada taxis all over the city.